Who needs a bustling seaside resort when you can opt for the serenity and low-key charms of South West Rocks? Just off the highway halfway between Port Macquarie and Coffs Harbour, this sleepy coastal town is the perfect spot to kick off your thongs and shake out your beach towel, and unravel a wee bit of history while you’re at it. There’s no need to send out a search party for your South West Rocks accommodation – it’s all right here! South West Rocks is nestled along Trial Bay, and if it weren’t for some cheeky convicts who knows what the bay would be called? Trying to escape Australia, the group of convicts stole a brig called Trial but ran aground in this bay. The wreck wasn’t discovered until 1817. There’s lots of interesting history around South West Rocks, including the stories from Smoky Cape Lighthouse and its historic buildings. Set in natural bushland on the headland of Hat Head National Park, the lighthouse has connections to the historic voyage of Captain James Cook in 1770, WWII, and as the traditional land of the Dunghutti Aboriginal people. It can also claim to fame its title as the most elevated lighthouse on Australia’s east coast. Who could deny that the views must surely be the best too? From here, a half-day walk leads to the picnic area of Arakoon National Park. With its own piece of local history, Arakoon National Park is home to the picturesque ruins of Trial Bay Gaol. Built in 1886 as a prison, it was also used as a World War I internment camp. The rocky foreshores and sandy shores in the background will ensure your photos are as dramatic as its past – the goal museum next door will tell you all about it. One thing’s for sure though: there aren’t many prisons with a seaside view quite like that! The natural beauty here is an attraction in itself. You can swim on the beach, explore the walking tracks, unpack a basket at one of the picnic areas or throw in a fishing line off the rocks. There are many beaches around South West Rocks to lap up the sun and dive into the waves. Horseshoe Bay, Main Beach and Smoky Beach are just a few of them. The area is well known for its fishing, snorkelling and diving. Divers will delight in discovering Fish Rock Cave about 2km offshore from Smoky Cape Lighthouse, where you may even see grey nurse sharks, turtles and spotted eagle rays. If you prefer to stay on top of the water as much as possible, nearby Crescent Head has one of the best right-hand point breaks in the world for the experienced surfers out there. Think this sounds like your kind of holiday? South West Rocks is just over an hour north of Port Macquarie, and half an hour south of Coffs Harbour. It’s also a five-hour drive from Sydney. With a laid-back beach vibe, a beautiful remote location and an interesting past to tout, wot more could you want? 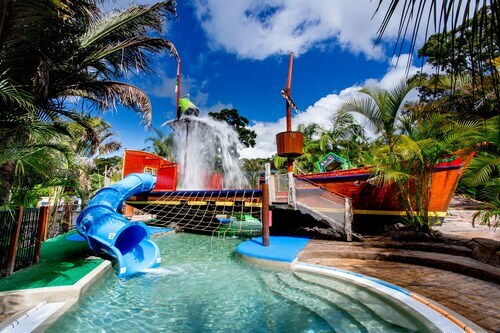 Have a look at our range of South West Rocks hotels and lock it in! How Much is a Hotel Room in South West Rocks? 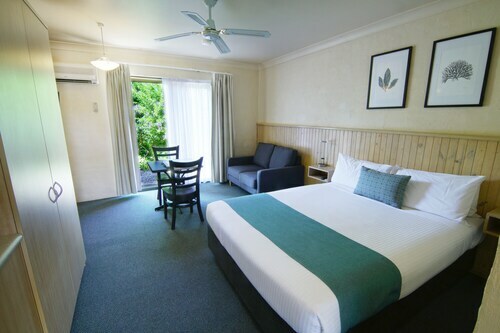 Hotels in South West Rocks start at AU$99 per night. Prices and availability subject to change. Additional terms may apply. Very nice & throughly enjoyed our short stay! Would stay there again if ever we come back to SWR (we are from Melbourne)! loved the kangaroos roaming around the grounds in the afternoon! !